NASA's Astronomy Picture of the Day features an amazing photo by Phill Round. It looks like a frame from a Spielberg movie—an humanoid figure appearing at the base of a mountain, with the unknown starry sky of an alien world behind it. In reality, it's a man getting into New Zealand's Hollow Hill Cave. 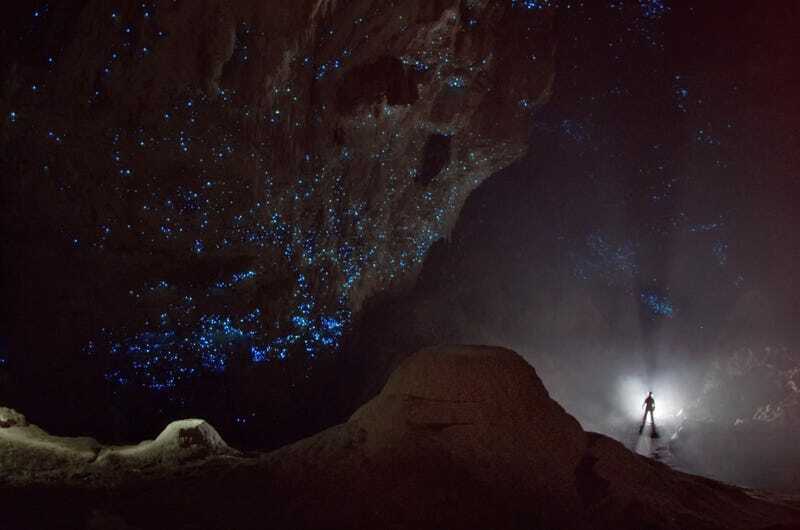 Captured in this long exposure, the New Zealand glowworms scattered across the cave ceiling give it the inviting and open appearance of a clear, dark night sky filled with stars. Unsuspecting insects fooled into flying too far upwards get trapped in sticky snares the glowworms create and hang down to catch food.